This flagstaff, 105 feet high, is constructed of metal pipe with a ladder and crow's nest for buglers. It was originally on the other side of the 1905 headquarters near the highway, having replaced an earlier flagstaff blown down by an 1889 windstorm. In 1930, after runaway mules felled the flagpole, the commanding officer ordered it relocated here. 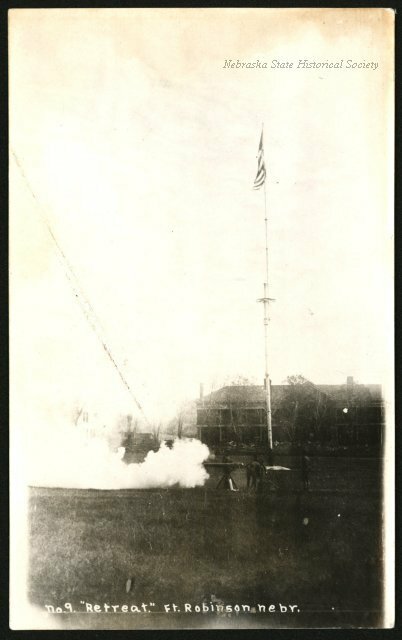 Sergeant John Kailey, with the longest service record at the garrison, hoisted the flag for the first time, on Washington's birthday, 1876. “Flagstaff, 1890,” Explore Nebraska History, accessed April 18, 2019, https://mynehistory.com/items/show/132.